A Care-A-Lot gift card purchased at a discount will save you money on all your pet supplies! That’s right! You will pay less on your entire purchase! With departments in dog, cat, bird, fish, reptile and small pet, you will find everything you need for your pets while paying less money! Finally, being a pet owner doesn’t have to put you in the poor house! No pet lover can deny the savings of a discounted Care-A-Lot gift card! Supplies to fulfill all your pets’ needs: health, dining, furnishings, toys, fashion, grooming, can be bought in one place and for less money out of your wallet! We understand how expensive it can be to own a pet. Food costs and vet bills are constant factors that you can’t ignore. Now, imagine how much money you will save when you use a discounted gift card! Purchase your discounted Care-A-Lot gift card and start saving money on all your pet supplies! Whether you order online or visit one of their store locations for grooming, day care center, and boarding services- the savings are the same! What’s more, gift cards are a form of currency, so you’ll still be able to use any coupons you have! With Cards2Cash, your pets will be in top shape, for less money out of your banking account! 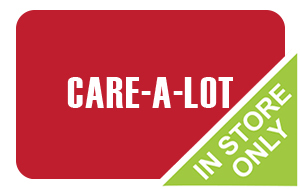 Buy your Care-A-Lot gift card today and start saving money immediately! Cards2Cash also carries discounted gift cards for other great pet stores! Be sure to check out our listings for PetSmart, Petco, 1-800-petsupplyscom, Tractor Supply, and more! With Cards2Cash on your side, saving money and keeping your pets healthy is easy! Do you have a Care-A-Lot gift card you aren’t planning on using? Cards2Cash will buy it from you! We buy gift cards for many stores, restaurants, and websites, and we pay top dollar for them! If interested, stop in one of our retail locations and receive on the spot payment OR fill out our online form, and we’ll get back to you with an offer. Cards2Cash is your one-stop gift card shop!